This is a beautiful and wonderful Buddhist religious text. 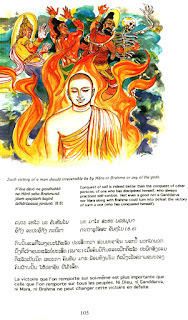 It's the dhammapada, illustrated and translated into Lao, English, French and Pali. For example, it shows a saying, parable or statement and a nice illustration. It's to the point and it's in 4 languages. It's a genuinely beautifully made hard cover book. I was fortunate to have been given this book by a relative years ago. I treasure it and I recommend it. Sample page shown below. I can see this having great use for lay people in understanding Buddhist concepts. I can even see this being of use perhaps in a Lao school as part of a curriculum. This book has an interesting story behind it. It was published with the support from The Corporate Body of The Buddha Educational Foundation (Taiwan), Wat Prayortkaew Dhammayanarm (Australia), and the Lao community in Australia. The original written text is from Ven. 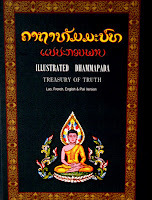 Weragoda Sarada Maha Thero (Sri Lanka) and his publication Treasury of Truth. Illustrations by P Wickramanayaja. 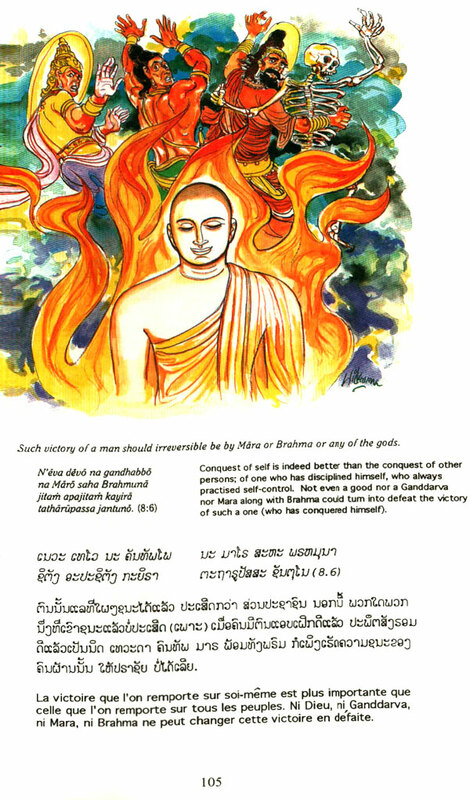 The Lao text is from the Lao version of the dhammapada printed in Laos back in 1973. 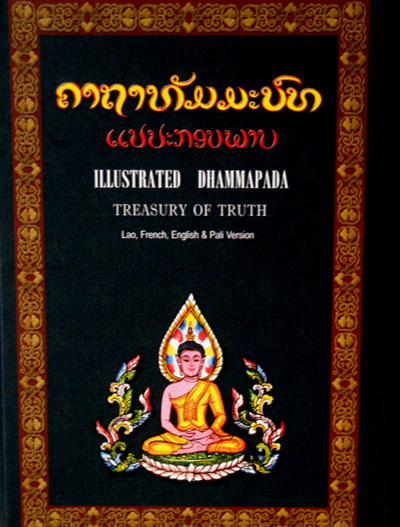 Wat Prayortkaew Dhammayanarm and the Lao community in Australia in Sydney, Australia, provided additional work and translation and pushed for the idea of having the book combine all these elements and to have them published. How and where is it possible to purchase this book ? Thank you. Unfortunately it's not for sale in bookstores or anything of that sort. We had received it as a gift. One possible option would be to attempt to contact the Lao/Australian temple mentioned above and see if they have copies available. It's unfortunate there isn't a bookstore to order online from for this title. If we do find one, we'll mention it!